The 12th Balkan Anarchist Bookfair will take place in Novi Sad, Serbia from 28th to 30th of September, 2018. The bookfair will take place in SKCNS Fabrika, Bul.Despota Stefana 5. Originally publieshed by Balkan Anarchist Bookfair. 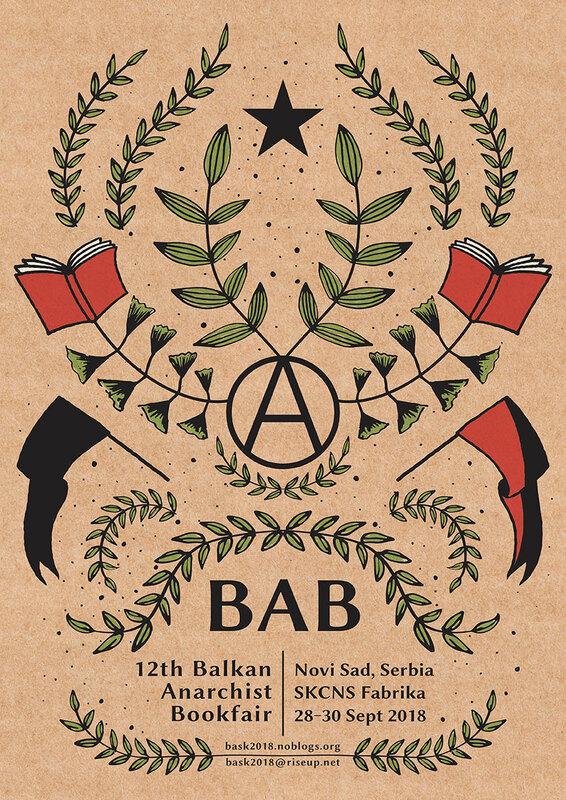 Every year Balkan anarchist bookfair [BAB] takes place in a different city across the Balkans and is organized by a local collective with an aim to connect local, regional, as well as international anarchist community. This year, we hope that even more participants, groups and publishers will gather in Novi Sad, as well as anyone else who is interested in anarchist and libertarian books and publications. First BAB was organised in 2003 and since then it happened in Ljubljana (2003&2013), Zagreb (2005&2017), Sofia (2008), Thessaloniki (2009), Zrenjanin (2010), Skopje (2011), Mostar (2014), Zadar (2015) and in Ioannina (2016). As Balkan anarchist bookfairs before, we are planning to open a discussion about subjects that matter to the community and problems we are facing as a movement. We are open for all suggestions and ideas that you’re interested in, and would like to present. Participation at the bookfair is open for all anti-authoritarian/anarchist/autonomous groups, publishers, initiatives, places etc. (not just from the Balkans) so we call on everybody to support the event with participation and materials. In order to help us organize the bookfair and complete the program on time we need you to confirm your participation as soon as possible. Contact us and inform us about the way you would like to participate. Here are some questions, though we encourage any further suggestions from you. 2. If you need a stall, what should its approximate dimensions be? 3. Let us know if you need help with the accommodation (free sleeping places are limited). * If you can’t come to the bookfair, you can consider sending some free publications, posters and other materials and we will distribute it for you. Also, you can consider sending books and other publications for sale, we will organize a stall for all of you that can’t come but would like to present your work at the bookfair. * The entire event will be held free of charge, organized under the principles of solidarity, mutual aid and the building of common power. So, if you are willing to organise a benefit event for the 12th Balkan Anarchist Bookfair, we would appreciate the efforts very much! The money goes to covering bookfair expenses.